Name is Rich. Collecting watches for a little over 10 years, with my first "nice" watch being a Tag Heuer S/el Automatic Chronograph that my wife gave me for our 10 year anniversary. The collection has grown to roughly 30 or so. I am a career US Air Force pilot with most of my time in the F-15 Eagle. My "call sign" is NEMO. I found ATG vintage watches after I discovered the Bremont brand at Kenjo Watches in New York City. I did some jet themed photos that Bremont used on their web site, newsletter, and one that was published in WatchTime magazine, so I think that put me on Bremont's good side. It has been fun to watch the brand grow and help out where I can. I am married 20yrs to Angela, with three daughters - Sara (14), Jenna (9), and Ava (4). Work keeps me busy, but other than watches, I like to tinker with and drive my 1972 Porsche 914 that I have had since high school. Life is good! I enjoy this site and learing about watches. Plus, my work hasn't "blocked" it yet, so it is a nice distraction from the daily duties. I'm Richard and I found the site when trying to find more info about my EP120's movement ! Like Rich above I also fly but nothing so exciting as the F15. The Boeing 777 is my current fleet operating from Heathrow and Gatwick. 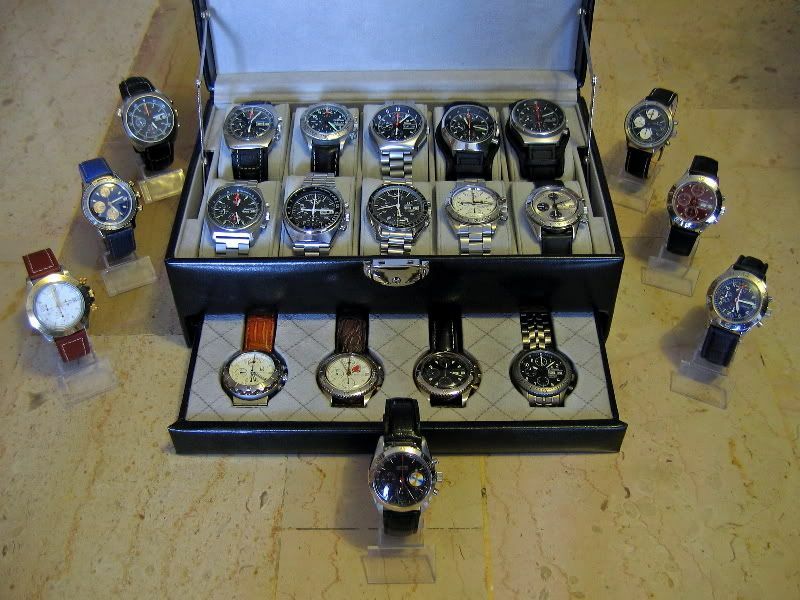 I have no particular theme to my watches but they include a Breguet Marine, Zenith, Bulgari and of course my EP120. I'm married to Sue (19 years). I'm Dave (no, not that one, or that one, but the other one!!). 41 year old Urologist living in Sydney. Married 10 years (also to a Sally - yes Simon, even our wives have the same name, and you're starting to scare me now) with a 7.5 year old son. Started with some vintage (facilitated by Al) and branched off into 1967 watches by coincidence mainly. Now a mix of old and new with some divers (5513 Subs / SD, Doxas, Tag-Heuer Super Pro and Spirotechnique) and some chronos (Bremont Alt1-C and EP 120 (soonish), Speedy, UG Compax, Heuer Camaro and some other oddities. Love this place - an eclectic mix of friendly loons with some GREAT watches. Hey, I take offence at that. What do mean SOME great watches! I am a relative newcomer to the world of watches. For the past 14 years watches have been complementary to my main interest of Historic motorsport, in particular racing in th Goodwood events, Top Hat series, FIA etc. In the last couple of years I have been trying to break a land speed record (225.9mph) at Bonneville salt flats. I also edit a magazine for a car club. The focus of my attention has now moved to Historic aircraft. At the beginning of last year I was flying regularly in a friend's Stampe SV4 biplane and started on my PPL. Unfortunately the flying came to rather an abrupt end (quite literally!) when we were lucky to survive a potentially fatal crash, resulting in us hanging upside down by the straps in what was left of the Stampe, with hot oil pouring everywhere. It was whilst lying in bed recovering from the injuries (cracked ribs, sternum etc) that I started hunting for a watch to take back to Bonneville Speed Week three weeks later, provided I could find a Dr willing to sign me off - one eventually agreed! When I read about what happened to Nick and the ethos behind Bremont I could hardly believe it - it was exactly what I was looking for - it had to be an EP 120 - I had been waiting 30 years for that watch. As the EP was not immediately available I opted for the Sinn 757 UTC based on the Breguet/Sinn aircraft clocks: Bonneville is one of the most inhospitable places on earth at up to 110 fahrenheit and its corrosive salt atmosphere ruins everything, so the watch had to be tough. I went back to Bonneville World of Speed in October and after more close shaves - parachute failure, throttle jamming open, parts flying off the car etc - decided I was running out of lives and have called it a day. Flying is far more fun (particularly in a Harvard) so it's goodbye Girard Perregaux Ferrari and hello Bremont. (This post ended up much longer than expected but hopefully will be of interest). Sinn 757 is a favourite of mine too, but unfortunately for me, they all are... Lol! Military wise I assume you've seen these in the Military Gallery? My name is Pascal. I'm 40. I live in Northern France. I'm French whenever I can get away with it, and Dutch any other day. It all started for me with an old white faced quartz Pulsar diver that had a jubilee strap. From that I got a Tag Formula 1 and that sealed it, since then bought a few others including a Heuer Bund which is a favourite, as well as a few heuer helmet clocks and different formula 1's. I have other stuff including something not reference on the much a Radomir Black Seal. Next for me is to pimp a Schaumburg Aquamatic Chrono no 1 I bought as a 'tough' weekender which I think should be pvd'd - after that a Monaco - a 1533B. Other than watches I like classic cars and like messing round with them.